I love a good tee, half tucked into jeans. Tied in the front. Layered under a blazer or a little oversized to lounge in or paint in. 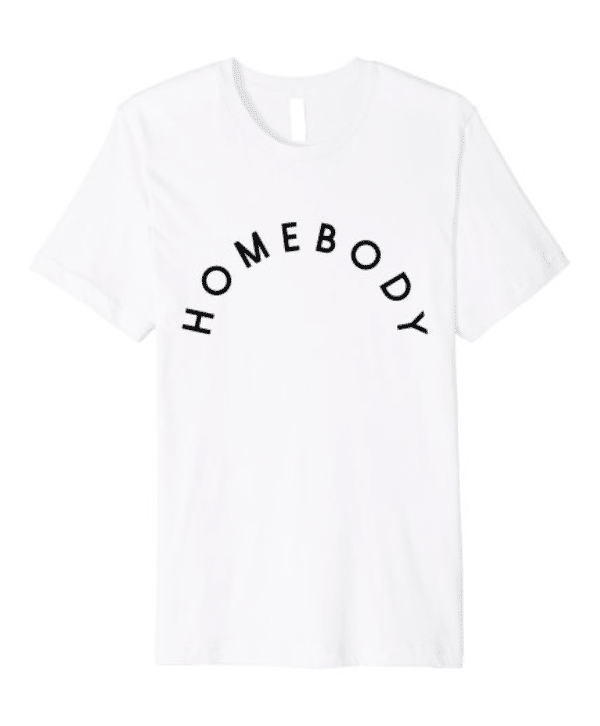 As a homebody, I live in t-shirts, which is why we’re so excited to announce we launched a line dedicated to home lovers everywhere. 1. This Is My Paint Shirt –Rainbow Premium Tee. 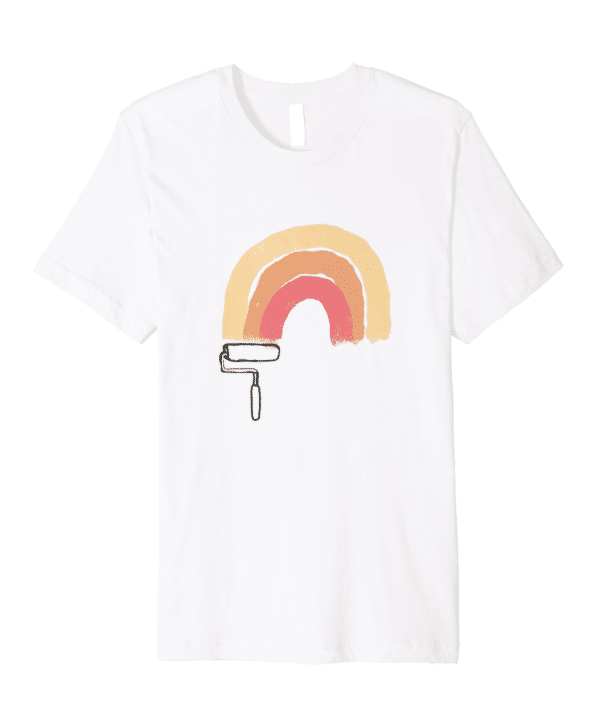 If you’ve ever painted a room, then repainted, then hold up, painted a third time, this shirt is for you. It’s a symbol of hard work, a badge of honor for all the swatches you’ve swiped. Don’t be shy about adding a few more colors to the rainbow while you’re at it. 2. 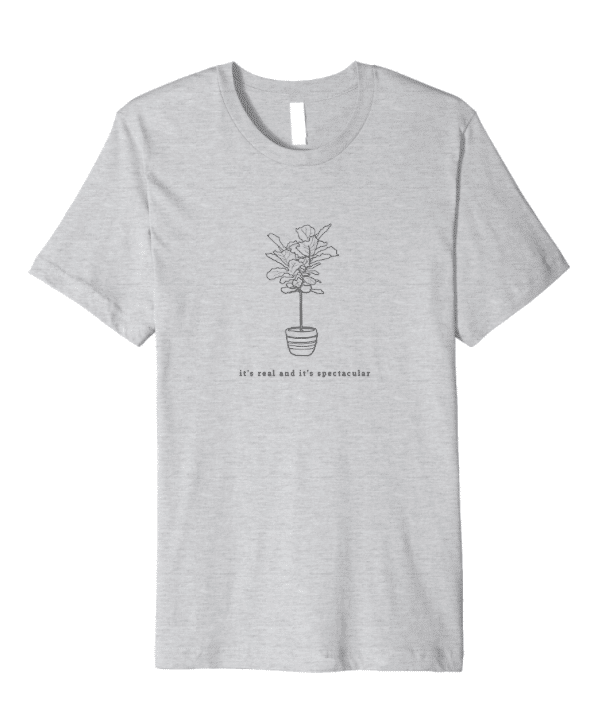 It’s Real and It’s Spectacular –Fiddle Leaf Fig Premium Tee.The ever popular Seinfeld reference adapted for proud owners of actual real life Fiddle Leaf Fig trees, everyone’s favorite houseplant–if you got it, flaunt it. 3. 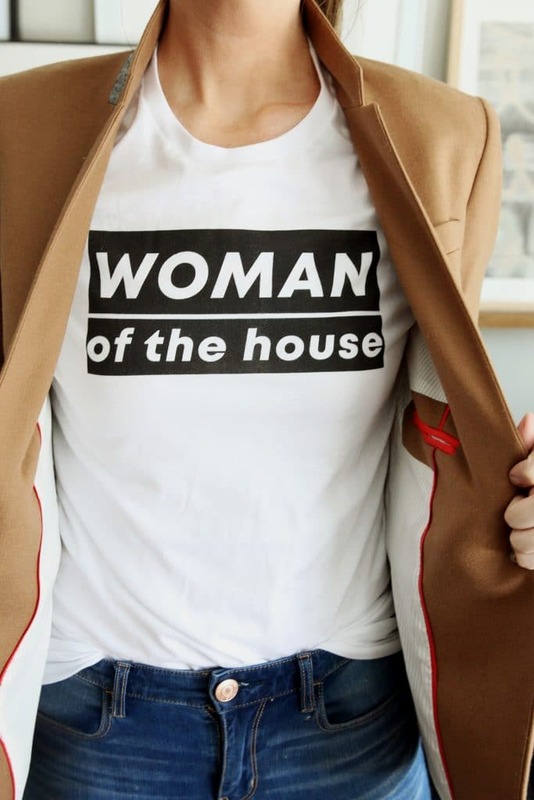 Woman of the House –Premium Tee. 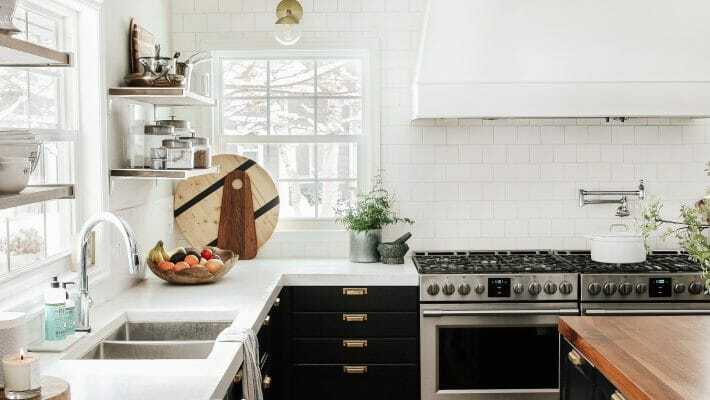 For the DIY-er who gets projects done, the mastermind behind the whole remodel, the hand holding the spray paint can, the eye squinting at the gallery wall…c’mon, we all know it’s the woman of the house. Wear the title proudly and confidently, and maybe under a sleek blazer. The one that started it all. This special twist on a plain white tee speaks volumes about who you really are, which just might be someone who cancels plans to stay home and watch a movie. You’re in good company. ;) 5. 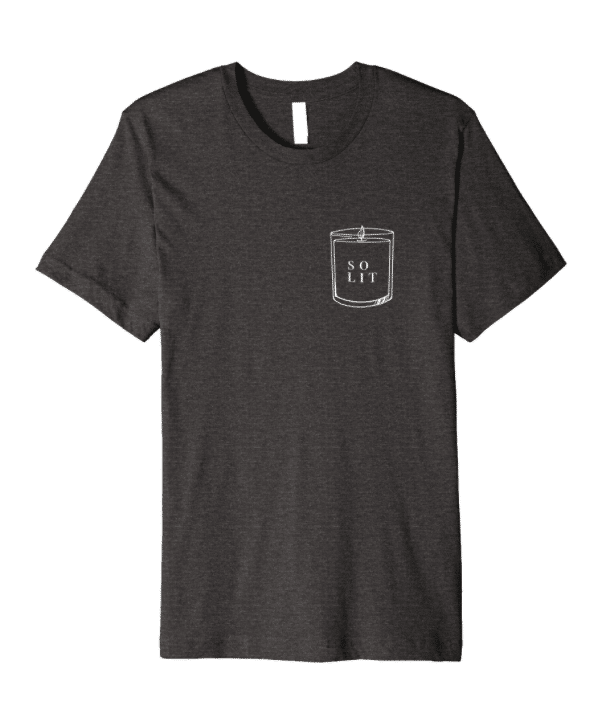 So Lit — Candle Premium Tee. Sometimes we party for real. And sometimes we party in the candle aisle at Target, you know? For anyone who understands the special thrill of finding that match-made-in-heaven candle for your home. These are just the first 5! Currently, there’s 20 more designs (including a handful dedicated to cabin life) in the pipeline we can’t wait to release and I’m designing more every day. We hope you love these shirts as much as we do! 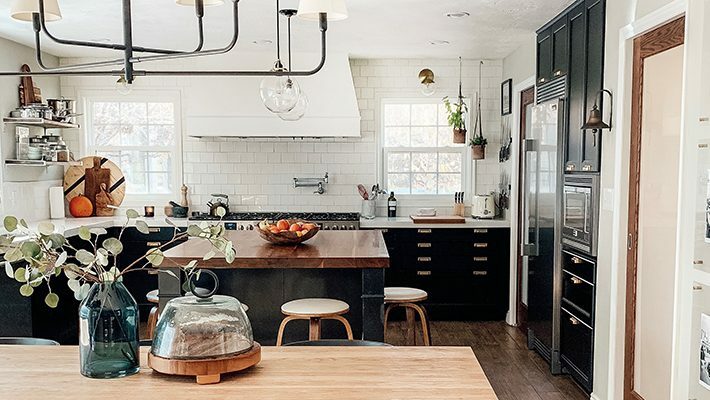 Shop the full collection right here, home lovers. I ordered the homebody tee in a large, but it is too big. Can I exchange for a medium! Will you be restocking any sizes soon? Ive been checking daily hoping to find men’s sizes available for the homebody shirt but they havent been. Looking forward to buying when they are back! We’re working with Amazon to get them back in stock – stay tuned! I am sure you have been asked this already, but will you ship internationally? I am in New Zealand and would love a few of these in my life. Patiently waiting for shipping to be available to Canada :) I need ALL of these in my life! I found your blog about a year ago and listened to every episode of your podcast. I read your blog regularly. Keep up the great work! 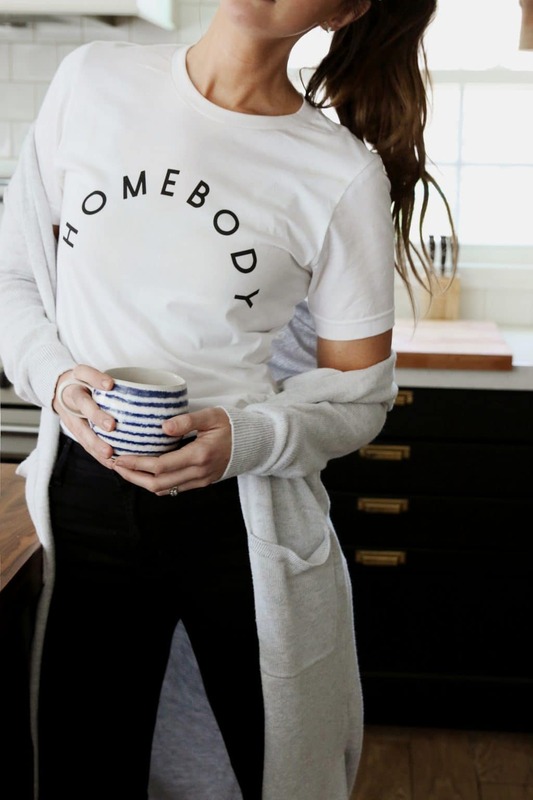 I just bought two Homebody tees – one for my sister and one for myself! Thank you! 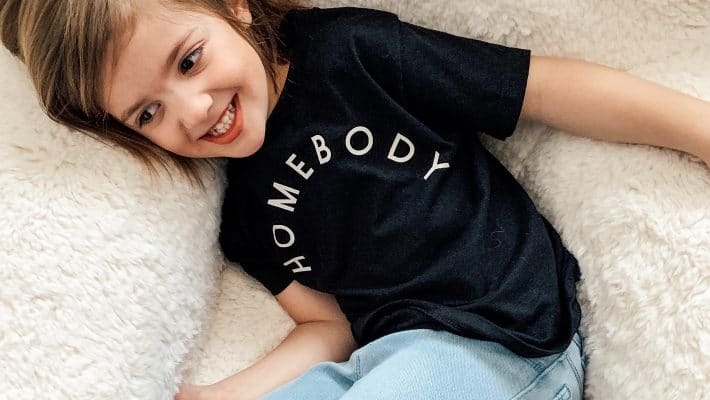 I’m not much of a T-shirt person, but I would buy the Homebody one in a second…if you had more inclusive sizing. Hopefully the limited sizing at the moment is due to this whole thing just getting off the ground, but I would love to see plus sizes available at some point in the future (and v-necks, as a few people have mentioned). Working on V-necks but there are sizing through 3XL! Please look past the “men’s” label that Amazon gave them. I’m wearing a men’s small in the image of me in the homebody tee and it’s an incredible fit! Still slim, long with a nice sized sleeve. What are the shirts made of? 100% cotton, or a blend of some kind? Thanks so much. Love the tee’s but also that grey cardigan! Where is it from?! There’s not one answer or reason why we stopped the podcast. I just wanted to focus on things that resonated more with me personally and this definitely fulfills me more creatively. So if you’re a woman larger than a medium you have to buy a man’s size? Way to make women feel good. If it were up to me, I’d get rid of the women/men label for fit anyway. The only difference is slightly longer sleeves–which I prefer! My favorite fit is the men’s small and I don’t feel any shame wearing it. I just gotta say, I’m an XL in women’s – I’m ordering a men’s XL for a comfy, slouchy fit and I don’t feel ashamed at all. If anything, I’m super grateful for the extra information about fit so I didn’t get something that wouldn’t fit me. Nothing she said was geared towards making any woman feel bad about herself. If anything, be mad at the fashion industry – not C&J. Besides, happiness comes from within – or should! We are all beautiful just how God made us. Julia – thanks for the extra info! I am so excited about this!!!! Congrats! Great shirts and congrats on your new endeavor! Congrats on the new shirt line! I love all the designs and can’t wait to order!! :) Are the white shirts see-through at all? They don’t look like it from the photos, but just concerned about a bra peeking through! Hi, I’m 5’5 and weigh 135 lbs. Like my Tshirts fitted but not tight. .. Do you only have women & men’s t’s no unisex? What size would you recommend. Also does Homebody come in black? We are going to release Homebody and Woman of the House in black next week! Also, because these are fulfilled through Amazon, we aren’t able to get rid of the men’s/women’s fit, but I would say they are nice and unisex. Both are slim. What size shirt do you normally like and I can tell you what size I’d recommend. I’m similar to Donna in size and normally like a medium. What would you suggest? I normally prefer the fit of a woman’s cut, but not sure if the XL would be big enough, especially if you like it and you are definitely more slim than myself. Do a men’s medium. It’s slim and sounds like it will fit you well. I can wear a men’s medium knotted in the front and love the fit. I looooove this new line! And your font for your product line is spot on! Would love to know the source of the blue striped mug in the first pic!! Thanks! Crate and Barrel! It’s my favorite because it holds just the right amount. These are great! Wish I could buy a couple. So cute! I can’t wait to buy one! Can you add details about where the shirt is made? I think a lot of your readers are conscious about what we buy and the factories that we support. I’d like to know more about your supply chain to make sure that this purchase doesn’t inadvertently support human slavery or trafficking. Thanks! Just did a little digging – the Amazon Merch Premium tees are made by Bella Canvas, which manufactures in the USA using cotton sourced outside of Uzbekistan. That’s great news! You should consider sharing these details in your Amazon listing so your buyers know that their happiness isn’t built on the shoulders of someone else’s suffering. Truth! Yes, love to see some Vs! $27 for a t shirt. Wow, you. Gotta be kidding me. Not a t shirt person, but if I was, I wouldn’t pay that much. Affordability is subjective. Negativity aimed directly toward someone else’s hard work and how they choose to price their goods is not called for, especially if you aren’t in the market for what they’re selling anyway. Let’s try to keep this a positive space, yeah? C&J, I ordered a homebody shirt yesterday and I’m stoked to see what else you all have up your sleeves (puns!). Congratulations on this new adventure! To me this comment doesn’t come across as overly negative, but as feedback that C&J might actually want to hear. Anyone that’s putting themselves out there with a new product generally wants more than just sunshine; it’s likely they also want to know the possible downsides. That way they can change or not based on what they prioritize. We don’t get grow and better without all types of feedback, and one measure of success is to be able to withstand and incorporate both. Just ordered mine! Love that we can order through Amazon…may be worth mentioning in the post. Thanks for all your inspiration and good humor. So exciting! And I love them. Whoohoo! If I am normally a women’s small but like my t shirts to be fitted but not tight, would I also do a men’s small?? I’m 5’3 and 120 pounds. I’d recommend a Women’s Large for you. Relatively! It’s from J.Crew right here and it is the best fitting blazer of all time. Looks like it’s 30% off today, too! V-necks for sure, cannot wear the crew neck! We’d love to introduce some vnecks! When I was first looking at the pictures of just the tee I thought they had some sort of eyelet detail in the backs. It took me way too long to realize it was a tag! Haha! I LOVE the “Woman of the house” t-shirt considering I have all boys at home. Too bad you don’t ship to Canada though :( boo!!!! Love them, congrats on this new line. Can you link your blazer? Love the color! Ha! “Because, of course they do”. Love it. So very cute! Will you guys be open to Canadian Amazon later on? We’ll look into our options. We’re kinda stuck with whatever Amazon allows for now, but not necessarily forever! Love! Any change you’ll be shipping to Canada in the future? Since it’s run through Amazon, we’re kinda stuck with their policies right now. But who knows what the future holds! This is so exciting! I really love them all. The name is perfect! I can’t wait for more to come. Congratulations!!! Will they be available to ship to Canada? even with a shipping price, I think I would buy all five! I love every one of these! 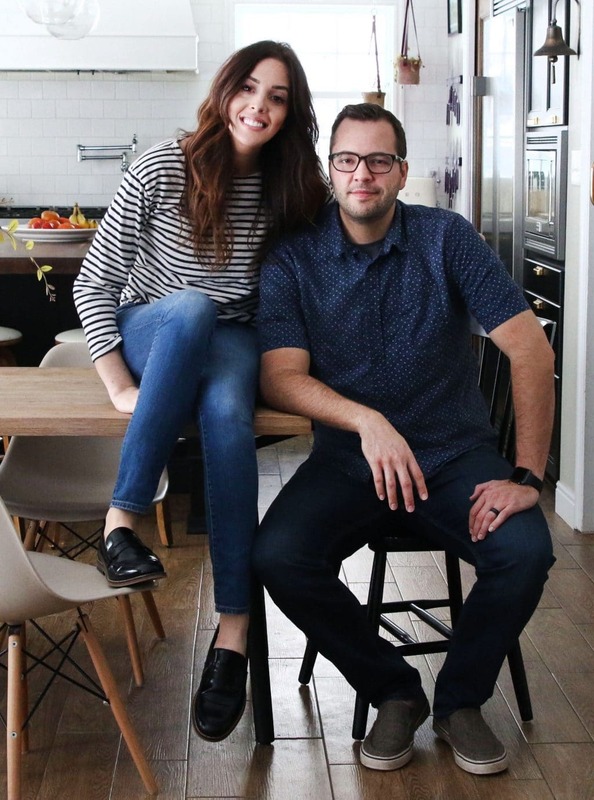 Here’s the thing….I cannot wear crew neck – I beg you to please make some of these V-necks! I cannot be the only one who looks like a bubble head in a crew neck. I wished they looked on me like they look on you, but sadly, no. Great job on the designs! I second this! Would buy all 5 if they were available as v-necks! Adding a third to this! V-necks are awesome. Also – a question: am I reading it correctly that the photos of you are in an XL women’s for the homebody shirt? Or are you just saying you’ve warn that size and find it comfortable? If that’s an XL women’s on you, I’m afraid even that size won’t fit me. Is it best to try men’s sizes in that case? I honestly prefer the men’s fit myself. It’s still slim and the sleeves are a little longer. I’d recommend sizing down in your normal size in men’s. So I normally wear a Women’s medium in t-shirts and I’m wearing the Men’s small in the Homebody one! ah – got it. Thank you! I third this! I have minor claustrophobia and usually cut the collars off of my crew neck shirts if I can’t find a v-neck. It’s a fine solution for a $3 tshirt I’ve found on clearance, but I don’t want to buy something full price and chop it up immediately! Love this! Any chance the rainbow shirt might eventually come in a couple color options?? Because I’d paint my living room for a third time to get it in blues and greens… who am I kidding, I’m painting it a third time anyway… Love this, guys!!! So excited for you.